Almost every conversation during the holiday season revolves around the word “thankfulness,” making this the perfect time of the year to help your children understand the meaning of being thankful. One of the many ways to do that is through community service. Volunteering is an enriching experience for all involved, and there are now more opportunities, and more reasons, than ever for families to volunteer together. The benefit of sacrifice. Giving a toy to a child who is less fortunate helps children learn that it’s good to sacrifice. Volunteering to clean up a park teaches children that there are more important things besides us and our needs. Tolerance. Volunteering allows children to be in touch with people of different backgrounds, abilities, ethnicities and ages. The internet offers a lot of information about volunteering. You can begin your search by logging on to Yahoo! Directory and typing “community service and volunteerism organizations” in the search box. Community service makes a lasting impression on children. They quickly learn that the service they provide impacts real people, and they feel good about it. The key to teaching your child a second language is to immerse him or her in the language. Your child’s teacher probably does this throughout the day by labeling and referencing items and actions in the classroom in different languages. You can work with your child’s teacher by referencing these labels and incorporating the language into your child’s play at home. With your participation, the immersion is complete. Learning language is a natural process when children are young. Introducing them to second languages such as Spanish, French and sign language encourages brain development. The earlier a child is exposed to another language, the greater the likelihood that the child will become fluent in the language. Second languages also help celebrate cultural diversity and create an understanding of the written word. A second language can open doors and unleash curiosity. Sign as you say words. Sign in one-word syllables (e.g., more, mom, dad, ball). Gently move your child’s hands to make a sign. Add to signing vocabulary, use signs with verbal cues. Say both the English word and the second language word for an object. Use the second language words interchangeably in your own speech. Name body parts, animals and colors in the second language. Visit our next blog post for suggestions on teaching a foreign language to toddlers and preschoolers. 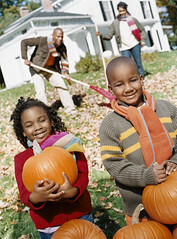 • While grocery shopping, ask your child to find an item that starts with a certain letter or find a particular cereal. • While in the park, ask your child to bring you nature items one at a time. Write the word for each item and then write a story using these words. • Show your child speech in the written form. Ask your child what he or she would like to buy at the grocery store and add it to your grocery list together, write notes to Dad or make “to do” lists. • Read with your child. Take turns reading pages, modeling intonation and punctuation cues. • Make up silly rhymes and alliterations. • Help your child cut large letters from old magazines. Talk about words that begin with each of these letters. • While driving ask your child to help you find a particular street sign. As with everything else in your child’s development, reading skills take time and patience to develop, and be assured that reading will happen when your child is ready. Also remember that children learn by example. Let your child see you read often, they’ll want to do exactly what mom and dad are doing. Reading is one of life’s most important skills, that’s why parents should focus on reading readiness early in their child’s life. Reading begins with language and how it relates to your child’s world. Creating a language-rich environment will help your child’s vocabulary grow. A print-rich environment may also help prepare your child for reading by making the connection between your child’s world and the symbols we use to communicate. Below are some suggestions on the steps you should take for infants through toddlers. 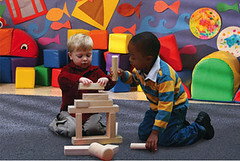 Our next post will look at ideas for preschool and pre-Kindergarten-age children. • Read simple board books with one picture per page, contrasting colors or simple pictures, and point to the items on each page. • While reading to your child, make faces–it’s fun and your child will notice subtle differences. • Allow your child to point and turn book pages. • Describe everything; name colors, shapes and sizes. • Read longer stories to your child and allow him or her to interact with the book–pointing, turning pages or even turning the book upside-down. • Name objects as your child points. • Make noises! Imitate cars, animals and eating sounds during play. • Speak to your child in a normal tone to demonstrate accurate sound recognition. • Enunciate words of interest like M-M-Mommy. • As syllables start to represent words, such as “juice” and “more,” expand upon them (e.g., “apple juice,” “Would you like more apple juice?”). • Read everything–signs, labels, toys and your child’s name. • Take cues from your child—interested, not interested, read or just look at the pictures, read more or stop before the end of the story? • Find and point out shapes and symbols in your home or community. • Recite rhymes and alliterations; pause to allow your child to fill in the last word or phrase. • Play games where symbols lead to action (e.g., two orange squares on the card means to move two orange spaces). I had such a great time evaluating and selecting the top eco-friendly toys for the Goddard Systems, Inc. and Eco Child’s Play holiday toy test! Mama K’s Aromatic Play Clay is 100 % natural, bio-degradable, gluten free play clay. It combines aromatherapy with activity and fun. With seven scents to choose from including soothing lavender, relaxing chamomile and tension-easing bergamot, fun never smelled so good! Mama K’s Play Clay is also suitable for kids with Celiac and Autism Spectrum disorders. Create your own sandy, dusty desert scene with the DuneCraft Desert Hothouse. This kit comes complete with a variety of cacti and succulents including the Giant Saguaro, Joshua Tree and many more. Little ones will have a blast designing a desert landscape with included gravel, sand, boulders and desert friends. These easy-to-grow plants will start sprouting in a week and will last for years. Pull up a chair; it’s time to serve up some eco-friendly imagination! The 17-piece Green Toys Tea Set includes a tea pot with lid, a sugar bowl with lid, a creamer, four cups, four saucers and four teaspoons. It is made from curbside collected milk containers and also meets FDA specs for food contact. A soft, educational toy, Hugg-A-Planet helps children learn about caring for planet Earth. It features over 600 labeled places, showing oceans, continents, islands and more. Ring a Thing transitions children from free play to first games with rules. It’s also a fun way for children to recognize colors and sizes. For 1-3 players, Ring a Thing is made of beech wood. HABA products have passed certification that guarantees a high quality environmental management system. Tree Branch Blocks (Natural Pod, Ages 2-8, Approximate Retail Price: $29.00) Bring the outdoors in with this beautiful set of rustic tree branch blocks. Perfect for stacking and building, each set comes with many unique pieces, various diameters and lengths for the ultimate in creative building. Tree Branch Blocks are made with kiln dried, locally (Vancouver Island) sourced Alder with Harmonic unbleached beeswax finish.